And then each night Jack had a dream. a big and bushy mane. and could not wait to start. The lively imagination of Young C.S. Lewis (1898-1963) - or Jack, as he liked to be called - took flight as he spent long hours reading books of magical lands and dreaming up new ones. Those vivid images never left Jack, even when he was faced with the early loss of his mother, the difficulty of boarding school, and the challenges of wartime service. As a writer, a teacher, and a communicator of powerful Christian truths, the man who gave us Narnia continues to encourage readers around the world. Now Heroes for Young Readers makes C.S. 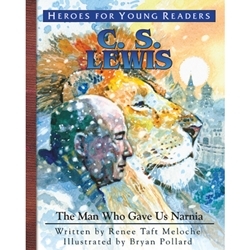 Lewis's remarkable story available in this picture book all ages will treasure.